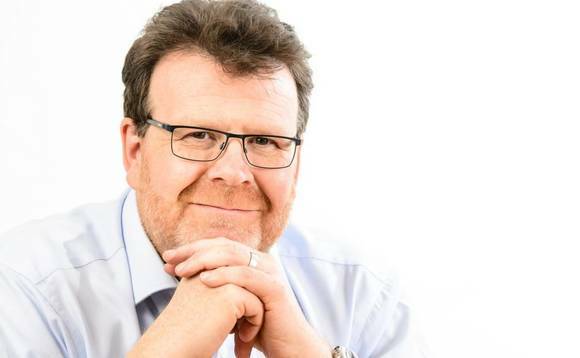 A Guernsey-based entrepreneur is behind a consultation project, launched this week, that will seek to determine whether there is sufficient market demand on the island to establish a new, locally owned and run, bank. The entrepreneur is Geoff Miller, pictured, who is overseeing the project through his newly-launched Guernsey company, Finance for Guernsey, of which he is chief executive. Miller, who describes “developing the alternative finance market globally” as his “passion”, has had numerous non-executive directorships and executive roles over the past decade, including having been the chairman, until last December, of GLI Finance Ltd, a Guernsey-based, AIM-listed provider of alternative financing for SME companies. A native Londoner, he settled in Guernsey five years ago after stints in Singapore and Moscow. Miller says he is personally convinced that there’s a gap in the Guernsey market for basic, high-street banking services, but he also maintains that until the necessary research has been carried out, it can only be a matter of informed opinion. He says those who have contributed to the funding of the consultation include himself and two others on his Finance For Guernsey team — Jeremy Stubbs and Marc Krombach — though he is, he says, the largest investor “because I am passionate about this project”. The remainder of the investors in his project come from a broad range of Guernsey industries, according to Miller, with no investor holding more than 10% of the business’s share capital. Miller isn’t the first person in Guernsey to comment on the island’s apparently disappearing banks. As reported here in November, Guernsey treasury minister Gavin St Pier told a Chamber of Commerce gathering that the States of Guernsey was working on a plan aimed at encouraging the creation of a new “‘savings and loans’-type institution” on the island, in the wake of the withdrawal from the market of a number of commercial lenders. St Pier didn’t provide details as to who it was thought might own such a new bank, or run it. He did, though, note that the reduction in the number of lenders in the Guernsey market, coupled with more restrictive lending policies by banks over the last few years, had created an “economic headwind” for the island, in the form of reduced credit available to its economy. Last month, meanwhile, the Isle of Man approved legislation designed to introduce a new “Alternative Banking Regime” on the island that would provide for two additional types of banking licence in order, government officials said, “to encourage new banks to the Isle of Man, and help to support the island’s diverse banking needs”. Miller and St Pier’s concerns about Guernsey’s shrinking banking sector appear to be borne out by the island’s banking statistics, which show the number of banks on the island at the end of June was 17% fewer than at the same time four years ago, to 29 from 35, while total bank deposits were down 15.4%, to £87.2bn. Going back 20 years, the decline is even starker, as the data shows some 76 licensed banks were present in Guernsey at the end of June in 1996. Total liabilities held by Guernsey’s banks, a figure which includes loans and other debt, stood at £113bn at the end of June, down 14% from June 2012. Miller says he and his Finance for Guernsey colleagues have been “actively engaged with [Guernsey’s] government about our plans”, and he stresses that if a new bank does go ahead, it will do so with an eye on “the objectives of the public sector”, though “it will [also] be important to ensure that the business model is resilient, and that will mean that [the] bank would have to turn a profit”. Which is why he says he’s not looking to replicate Gibraltar’s government-owned bank. “Were we to move ahead with the bank application, it is important that it [would be] primarily privately funded, not dependent on Government funding,” he says. “Should the government feel that the business plan warrants some investment, we would be happy to discuss this, but we wouldn’t want the government in any form of controlling position, and I am certain that the government would not wish this either. The Finance for Guernsey survey – which may be accessed via the organisation’s website, here – will remain open for another three weeks, Miller says, and is open to Guernsey residents only. “We want as many people on the island to respond,” he adds, although the original minimum of 200 responses has already been reached.